2018 End-of-Session Report - Maryland Votes for Animals, Inc. 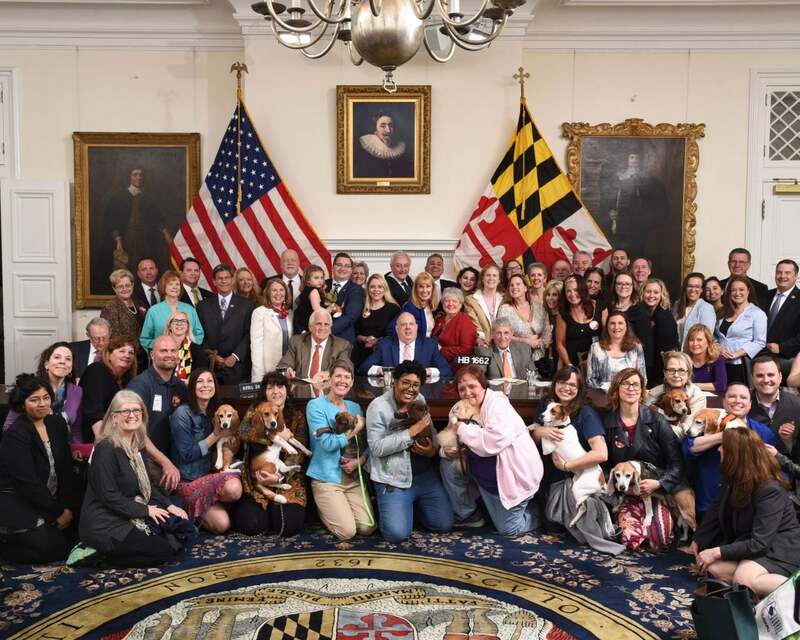 Thanks to YOU, our dedicated team of advocates, organizations, and legislators, 2018 was a HISTORIC year for animals in Maryland! Three bills passed that greatly improve the welfare of animals in our state. Cracking down on the cruel Puppy Mill industry, Maryland became the 2nd state after California to ban the sales of dogs and cats in pet stores. In what has been called “The Beagle Bill”, Maryland followed six other states in passing legislation to save healthy cats and dogs from being euthanized after they have been used in research. Maryland joined 26 other states, including all of Maryland’s neighbors and the District of Columbia, and passed legislation allowing judges as a condition of sentencing to ban convicted animal abusers from owning, possessing, or residing with animals for a specified period of time. Some of the bills that we championed were unsuccessful this session. However, as with the Humane Adoption of Companion Animals Act of 2018 which took four years to pass, some legislation takes several sessions for legislators to become familiar with the issues, especially ones that are complicated or that they have never considered. This past session’s bill dealing with animal sexual abuse is a prime example of the type of complicated issue that will most likely require several sessions to pass. The list of bills below shows the many areas in which we worked to improve animal welfare in Maryland. Some issues could be handled by passing humane legislation. However, some issues required us to defeat legislation that would have harmed animals, such Statewide Sunday Hunting. We could not have accomplished these monumental victories without your grassroots support. Your calls, emails, and visits to your legislators on Humane Lobby Day sent a powerful message: Animal issues matter to voters! Adoption of Companion Animals Used in Research (HB 732/ SB 675): Sponsored by Delegate Kramer and Senator Hough, this bill allows healthy dogs and cats an opportunity to be adopted into loving homes after they have served their time in research. Cracking Down on Puppy Mill Imports (HB 1662): Sponsored by Delegate Kramer, this bill will prohibit the sale of dogs and cats at pet stores by 2020, thereby stopping the flow of dogs and cats from Puppy Mills into Maryland, and encourage the stores to work with shelter and rescue groups for adoption events. Animal Cruelty – Sentencing Conditions and Selling Ban (HB 212/ SB 1038 ) – Sponsored by Delegate David Moon and Senator Will Smith, this bill allows a court to order as a condition of sentencing to prohibit a defendant convicted of certain crimes relating to animal cruelty from owning, possessing, or residing with an animal for a specified period of time. Unprotected Birds – Pigeons (SB 94 ) – Introduced by Senator Joan Carter- Conway, this bill adds “pigeon” to the defined term “unprotected bird” in Maryland’s wildlife laws with an explicit prohibition on cruel pigeon shoots. Protecting Animals from Sexually Abusive Predators (SB 800/ HB 1134): These bills were sponsored by Delegate Atterbeary, Delegate Mike Malone, and Senator Lee. Current law criminalizes broadly “unnatural or perverted sexual practices” and provides little clear definition of what constitutes sexual abuse to animals, leaving large loopholes identified in recent cases by prosecutors. This bill would have closed these loopholes and penalized others involved with animal sexual abuse such as those who allow their pets to be sexually abused by others, usually for profit, or those who force others to sexually abuse animals. Protecting Elephants by Prohibiting their use in Performing Shows (HB 618): Sponsored by Delegate Aruna Miller, this legislation would have prevented circuses from using elephants in Maryland due to their repeated violations of the Federal Animal Welfare Act and the threat to public health that this use of unpredictable wild animals poses. Wildlife Trafficking Prevention (HB 712) – Sponsored by Delegate Luedtke, this bill would have prohibited purchase, sale, offering for sale, or possession with intent to sell certain parts or products of specific endangered species with exceptions for genuine antiques where the endangered species product makes up only a small portion of the item. Cruelty to Animals – Seizure and Removal (HB 565) – Sponsored by Delegate Moon and Delegate Mike Malone, this bill would have clarified the procedure when an owner’s animals are seized as a result of animal cruelty and the owner fails to file the petition for return of their animal. Hunting – Sundays (SB 817/ HB 1338) – Sponsored by Senator Johnny Salling and Delegate Carl Anderton, this bill would have repealed the prohibition against hunting on a Sunday and authorized the Department of Natural Resources to allow a person to hunt on a Sunday on private property or on public land designated by the Department; authorized the Department to allow a person to hunt deer in a county for a half day on certain Sundays; authorized the Department to allow a person to hunt deer in a county for a full day on certain Sundays in certain deer seasons. Wildlife Management – Shooting at Nighttime (SB 747) – Sponsored by Senator John Astle, this bill would have prohibiting the Department of Natural Resources from authorizing a holder or an agent of a holder of a Deer Management Permit to shoot or discharge a firearm at nighttime.